Who is coming to our Tipi Open Day in Chester???? February 17, 2015 / admin / Comments Off on Who is coming to our Tipi Open Day in Chester???? Only a couple of weeks now until our Open Day at Trafford Hall. Starting on the evening of Friday 6th March, you will be able to come along and see our Tipis in all their glory on the stunning grounds of the Georgian Manor at Trafford Hall near Chester. This is the perfect opportunity for any future brides or grooms to come along and talk to us about planning a wedding. We will have lots of our preferred suppliers there as well including a DJ, Caterers, Toilets, Lighting Technicians, Stationers and lots more. Everything you could possibly need to make your big day extra special. Just pop in and take a look around or call us to make a more official appointment and have a chat with one of our team members. We can advise you on numbers, layouts, locations, everything you could possibly need to plan your Wedding Day. January 13, 2015 / admin / Comments Off on Open Weekend Coming Soon!!! We are excited to announce our next Open Weekend at the beautiful Trafford Hall in Chester. The Tipis will be open from Friday 6th March at 3pm and the team will all be on hand to show you around and answer all of your questions. For directions to Trafford Hall visit their website at www.traffordhall.com. For any other enquiries or to book an appointment with one of our team at our Open Weekend please call 01244 360 214. Looking forward to seeing you there! Remember – you don’t have to be a Bride or Groom to come to our Open Weekend. Our Tipis are perfect for all sorts of parties, festivals and events as well as Weddings. Come along and see for yourself! Ok, so we admit we have been raving about our Open Weekend quite a lot today. But we can’t stop without saying how flipping great Trafford Hall were. What a delight it is to work with such a professional venue and such a lovely bunch of people. This is only a very short post, but can we just mention Trafford Hall is available to hire for Conferences and Events as well as Weddings! Just look how great our Tipis look in the Trafford Hall grounds. Autumn Open Weekend – This Weekend!!! October 14, 2014 / admin / Comments Off on Autumn Open Weekend – This Weekend!!! Are you looking for a stunning unique venue to host a wedding, party, corporate event or celebration????? Have you ever considered using a tipi? Our tipis are not just tents – they are stunning structures that add that special wow factor to any event. Don’t believe us? Come along to Trafford Hall in Chester this weekend and take a look. We will be there from 2pm-9pm on Friday and 10am-5pm on both Saturday and Sunday. You are welcome to come along and just browse, or you can make an appointment to have a one to one chat with a member of our team. We can help you to plan your event, give advice and make suggestions. We hope you can make it. See you there!! We are so pleased to announce our next Open Day with our new friends Trafford Hall from 17th to the 19th October 2014. The Open Day provides us with an opportunity to show off our amazing Tipis and for you to come and take a look at a brilliant Cheshire venue for your wedding, corporate event, party or festival. Trafford Hall is home to the National Communities Resource Centre, a charity which has been supporting low-income communities for over 15 years. They are unique in that they are lucky enough to be based in the most exquisite Georgian Manor house with stunning grounds that make the prefect choice of wedding venue. Just take a look at a selection of their gallery images to see how great your Wedding could look. 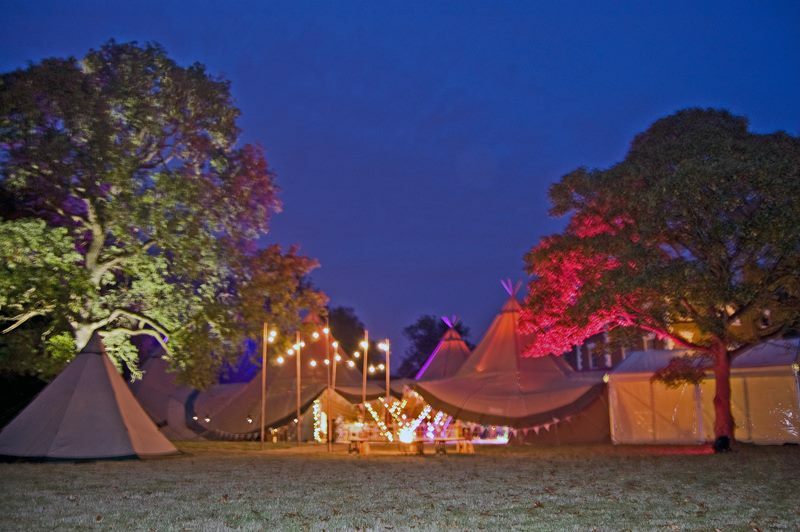 Our Tipis make the most of this amazing venue by providing a perfect atmosphere for any event. Whether you are looking for a fun relaxed feel for your event, or you are wanting a more professional, corporate setting, we can help you to decorate the tipis however you want. The Giant Hat Tipi is extremely impactful and much more interesting than a standard marquee. Come and see them for yourselves at our Open Day. We are open from 2pm until 9pm on the Friday and from 10am to 5pm on the Saturday and Sunday. Our team members will be on hand to have a chat, and they can provide you with all of the information you want. They can even help you with advice about catering, music, decoration, lighting………pretty much everything you need to make your event a success. If you are an Event Manager, then the Open Day is a perfect opportunity for you to get all of the information you need about hiring tipis. We can provide a range of different sizes and layouts depending upon your numbers and specific requirements. If you haven’t considered using a tipi for your event before, come along to our Open Day and let us tell you why it is the perfect choice. We can guarantee that it will bring a special something to your wedding or party and will certainly help to make it a day to remember.